As I write this, it's just over an hour until the end of one of the greatest animated series of all time. As we wait for the epic conclusion, here's a little list of things I hope to see happen in the one-hour finale. 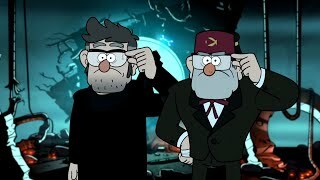 So, if you've seen the Gravity Falls finale, you'll know that the one thing which seems to have been hurriedly shoehorned in is Stan's inexlplicably quick recovery of his memories. That was one HELL of a setup for the season (possibly series) finale. Which will be spread over anywhere from 3-5 episodes according to what I've read. If you'll notice in last night's blog, I headed my section on Gravity Falls with an image of Bill taken from a page of Ford's journal. I've been staring at that image and thinking a lot about it. Specifically, about the circle of symbols that surrounds Bill. We FINALLY HAVE A DATE FOR (THE REST OF) GRAVITY FALLS. That was an INTENSE episode. And lots of tragic backstory. The single biggest mystery has now been laid wide open. So yeah on Sept. 7 hide for your life. okay? And I got to say I really enjoyed it. In The Last Mabelcorn, I think Mabel ripping (that have the Unicorn on it) that sweater has more significance than just a passing event. 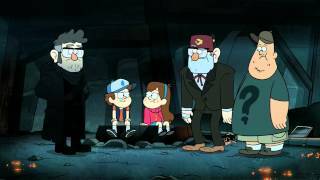 I think Mabel is starting to follow Dipper down the innocence lost path. I know I’m not suppose to like Celestabellebethabelle, but she’s just so hilarious in how self-absorbed she is xD. look like two of the charaters from Gravirty falls are doing anime-glasses- glowing-thingy. This episode was very clever with its humor. The jokes about the political spectrum and the candidates was too funny. It’s well timed considering Donald trump is running and throws shade to the stereotype of elections. The meme was the best joke out of all.